PGI-225 Black Ink Cartridge Twin Pack is rated 4.6 out of 5 by 33. Rated 4 out of 5 by Field Consultant from The easiest cartridge to replace! I do a lot of printing from my home office, therefore I replace ink cartridges quite often. What I like about this particular kind, besides the good printing results, is how easy it is to replace - snap the old one out, snap the new one in. Done. Less practical is the wrapping: Often the tab gets stuck and I end up having to find scissors to cut the plastic. I also don't like the fact that there is very little ink in the cartridge, making replacing necessary way too often, compared to other printers I have had in the past. Overall, the quality is good and the pros still win over the cons. 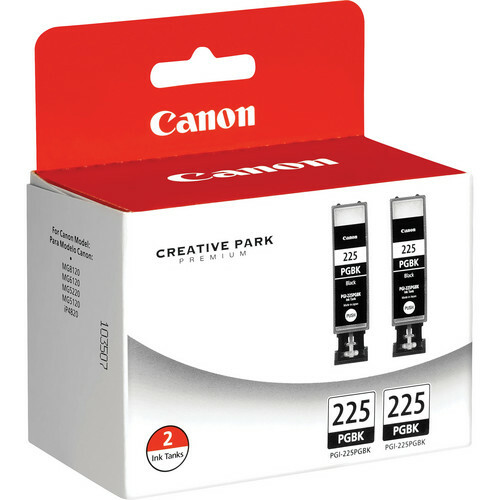 Rated 5 out of 5 by Anonymous from No substitute for the original I needed to replace my Canon Pixma882 MFP ink jet cartridges. I was considering alternatives to Canon's more expensive OEM items when, in an unrelated conversation, a friend complained about the poor performance and longevity that she had experienced with a substitute. That reminded me of my own experience with substitutes -- they ruined an earlier printer. Bottom line: I paid more for the OEM cartridges and will continue to do so. It's not worth ruining an expensive piece of electronic equipment for a couple of dollars. Rated 4 out of 5 by jetguat from Canon Quality. Sometimes you need to pa 5 stars if they were cheaper. Canon, IMHO, mean quality. I dont bother with off-name brands. I trust canon. Not had a problem over multiple printers, different ink styles, camera's etc. Its a name you can trust. I'm satisfied. Rated 5 out of 5 by Mary the gardener from The Real Deal! We buy all of our Canon ink cartridges from B & H. I feel confident that we are getting true Canon ink (the best), not an imposter. B & H provides the best price and service. Rated 4 out of 5 by Steve A. from Just what the printer ordered This is for a Canon MG8220 printer. I have found that the printer works best with the OEM ink cartridges. They are a bit pricey...however B&H did have the best price, as they always do with the products that I purchase. Rated 5 out of 5 by Anonymous from Just what I needed. Saw this twin-pak ink tanks online but not in the stores. It was exactly what I wanted and the price was right - and no shipping charge! Prompt delivery and tracking all the way, that's the way to do business. Rated 4 out of 5 by Anonymous from Will Purchase Again This ink cartridge is going into my Canon MG8120. B&H was right on price. This printer is new for me and I have still to work the numbers and determine the cost of printing. Other than that printing is great. Rated 5 out of 5 by James from Canon Ink always works well I use this ink in a Canon MX712 all-in-one printer. The Canon ink never gives me a problem, and the printer keeps on working. I never have to think about it. And, that's how it should be.